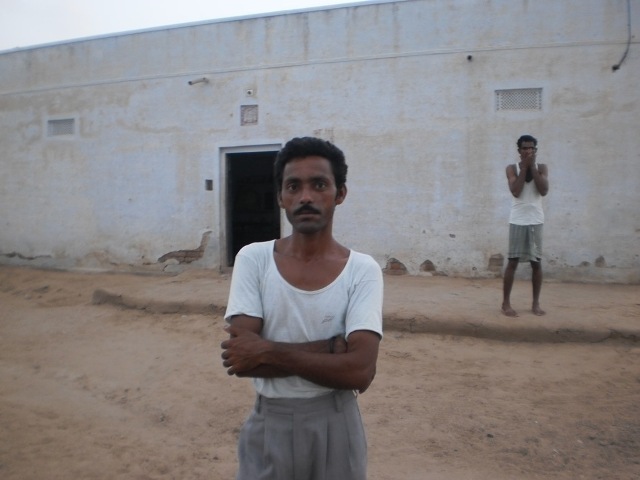 There live the refugee families from Pakistan in the villages of Pugal area of Bikaner. 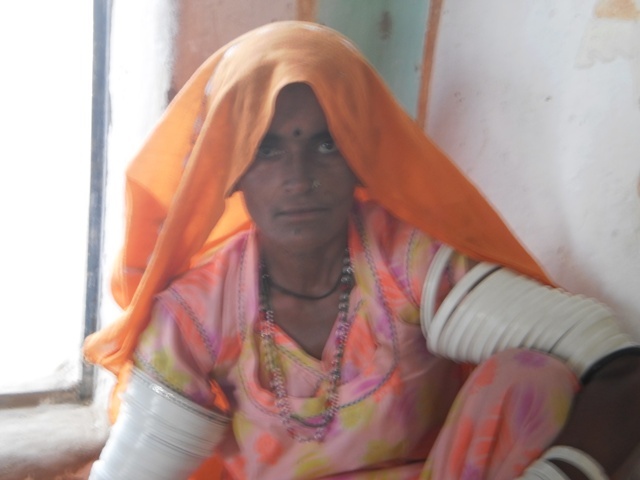 Among these families, in the hand of women of the Meghwal community, there is an incredible craft of hand embroidery called Kasidakari and called Bharat in their local language. Tari devi represents these nearly 1500 women here doing this craft. They are all artisans with extraordinary skills and have a great aesthetic sense. The hand embroidery Bharat is famous in India and all over the world. In spite of having a very tuff life full of struggles their conduct of honor and dignity with others and concentration in the craft activity is very inspiring. Tari Devi lives here in village 8 AD (govt. name) with her husband Gokul Ji, two daughters and three sons. 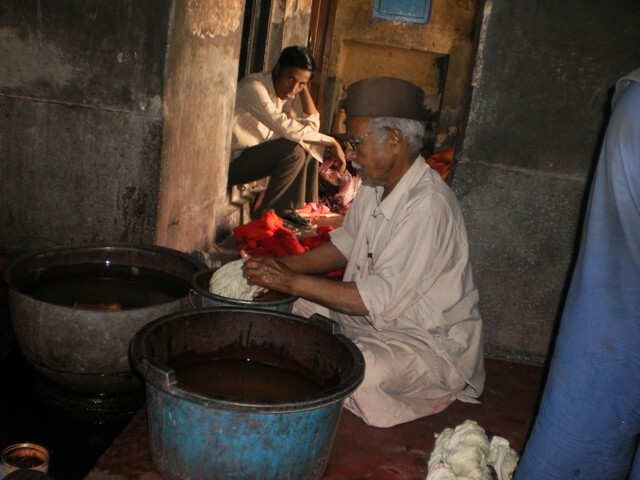 Om Ji ( Omprakash Meghwal) represents a team of 500 weavers. He is an excellent weaver of all type of hand woven carpets. 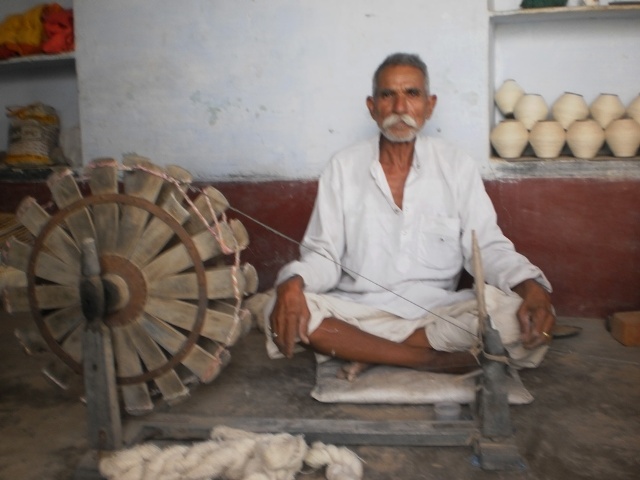 He has worked whole his life in the field of hand weaving. Hard work is his formula and honesty is the policy. He did not lose his faith in handloom in its toughest times when other weavers were leaving it and going into another fields for employment. He did not ever have a lack of work. Om ji has invented many new techniques of producing new designs in handlooms. 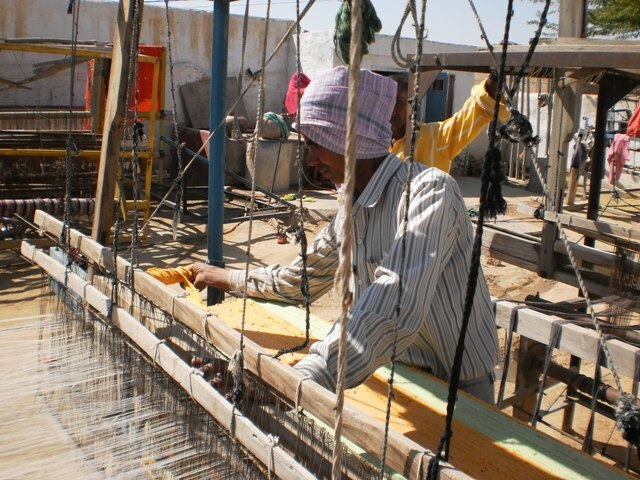 Most of the weavers are spread in the villages around Bikaner and make cotton handloom fabrics for shirting and soft home furnishings, woolen shawls, stoles, fabrics for jackets and blazers and durries (floor coverings). 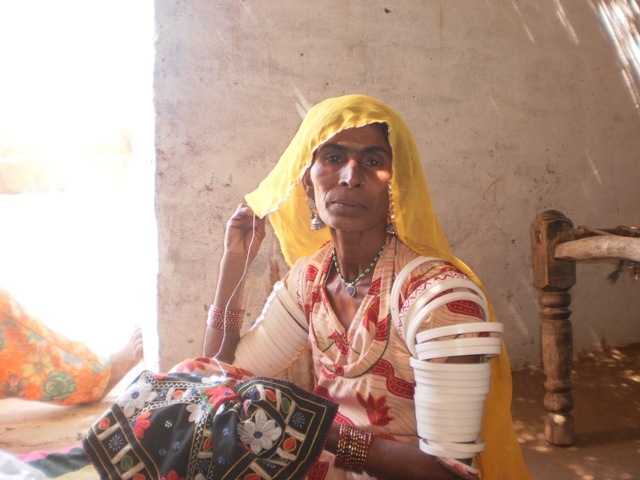 Nearly 100 weavers live 150 kms away from Bikaner in the village Tankla in Nagaur district, who weave beautiful artistic durries very unique in their designs and textures, made with the materials of wool, cotton, jute, camel hair and goat hair. Shyam ji is a tailor of remarkable talent. He has a deep interest and experience in making garments of new fashion. He has made toughest of the toughs designs for HASTSHILP society. He is never tired and never gives up where other tailors are afraid of trying new samples. 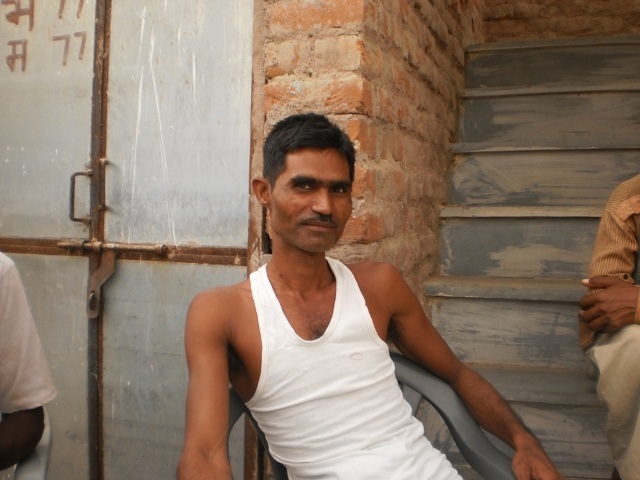 This enthusiasm of Shyam ji for being ready to make new designs is uncommon in the people here with tailoring work. He has his own team of tailors to face any challenge. You are a Rangrage (dyer). 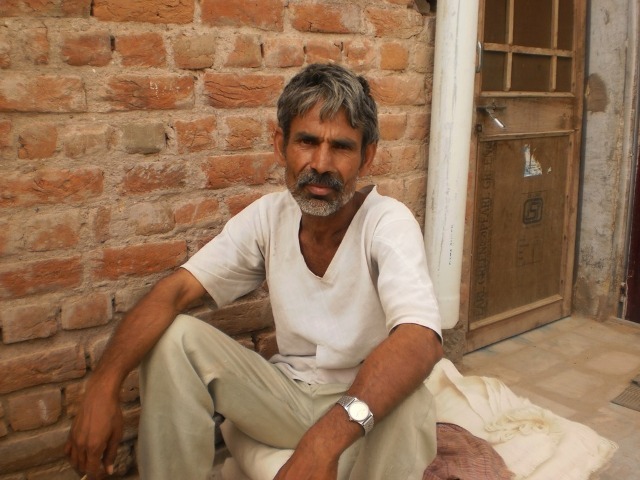 He has a special dying craft that is Bandhej (tie and dye). 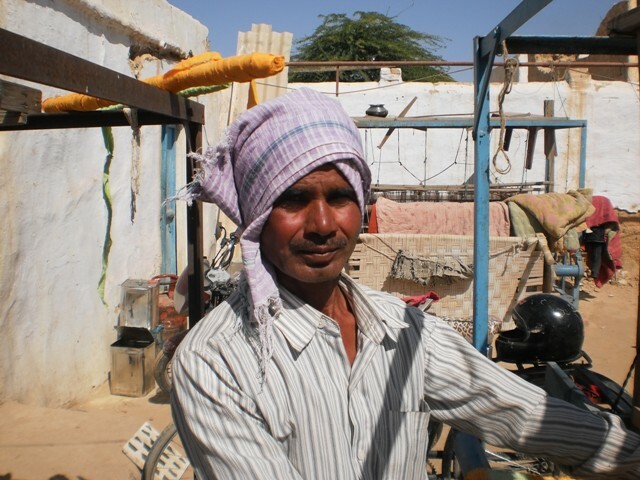 He has been dying cloths by this craft traditionally for the women from Rajput community to whom the royals belong. The costumes he dyes for them are Ghaghra (long skirt), choli (blouse) and a Odhana (veil ). He is master of many different designs and patterns which are mentioned in the crafts part of this website. He is famous here by the name “Topi wala “ that means the man with a hat. He is from Muslim community and has many family members in his team for Bandhej work. Rajput women order him directly for dying their costumes in Bandhej, and the man for their colorful turbans. 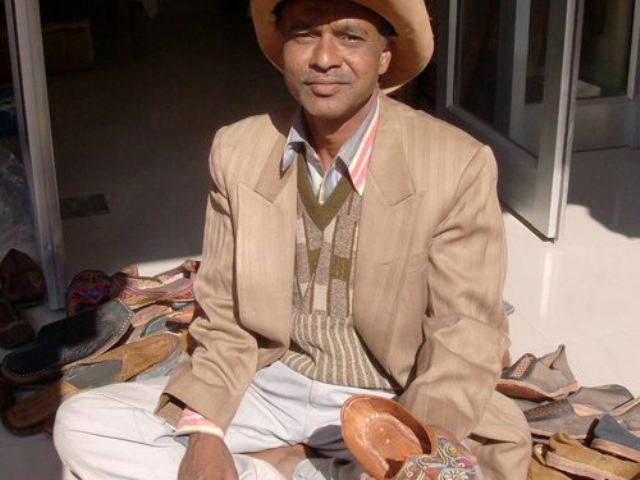 You are from Jodhpur and represent the leather craft. 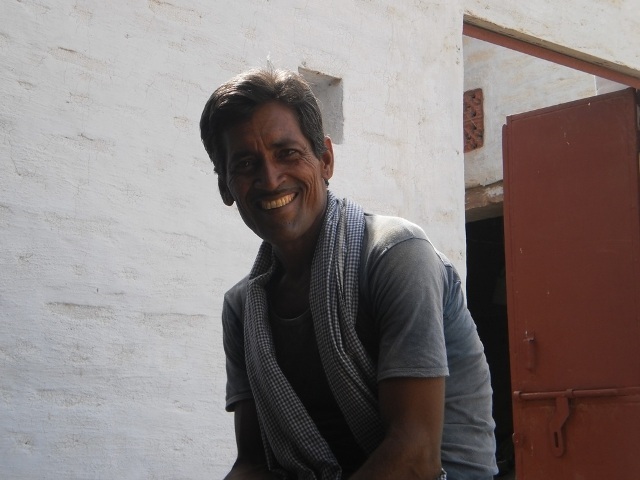 He is from Mochi community which has been traditionally doing the work of shoes making for the society. These shoes are called Mojari and have a distinguish recognition in the culture of Rajasthan. Now he is making many new designs and range into his products. He has a great zeal for his work. You know the art of hand knitting. She weaves beautiful sweaters by this craft for his family members and relatives. She does this work free of cost along with the other work she does for living. She has knitted a sweater for me for which I am highly obliged to her. Here many women do the hand knitting work and make sweaters for their families. The sweater made by this way have love and care in every thread and knot of it. This craft has not yet been commercialized but if this could possible then these women can get the employment facility at their own homes. The person who uses the products made by them by this way would feel the love and care they knit which is impossible in the things produced in bulk by machines.